When Oysters Die, the World Listens. Under a pressing timeline, scientists, policy makers, and farmers have joined forces to raise awareness for finding solutions to counter the effects of ocean acidification on Puget Sound oysters. On a bright afternoon in April, sun-struck by the Olympic Mountains’ rain shadow, the Taylor Shellfish Hatchery is an idyllic facility. The farm, one of three owned by Taylor, is located on Dabob Bay, a little over ten miles from the town of Quilcene, Washington. The long stretch of beach adjacent to the farms is layered with deep, wet sediment dotted with lavender-tinted bivalve shells. Oysters grow naturally out there, according Dave Pederson, an employee at Taylor Shellfish for over two decades, but not enough to make a business out of it. Harvesting shellfish at Dabob Bay has never been consistent enough annually to generate enough revenue as an industry itself, and any extra oysters collected by Taylor Shellfish is considered a bonus for the company. Taylor Shellfish has been operating in Quilcene since the 1970s as one of the leading shellfish growers in Washington, which has the largest shellfish industry in the nation. For Quilcene and other small, rural towns along the Puget Sound, oyster farming is their livelihood. Many farms have been part of the industry for over a century including Taylor Shellfish, which started in 1890. Since, it has grown into three separate farms that produce oysters, geoducks, and clams, as well as bivalve seeds that are distributed internationally. But ten years ago, the hatchery collapsed. The annual production between 2008 and 2009 was off 75% from historic levels and there were no oyster seeds for the farms. Taylor Shellfish was not alone; this phenomenon proliferated throughout oyster hatcheries in the Puget Sound. Only in hindsight could this event be viewed positively as it launched the Pacific Northwest into the limelight for fighting the global issue of ocean acidification. Research on ocean acidification (OA) has been ongoing since the 1960s; the simple chemical reaction from adding excess carbon to saltwater has long been known and there was no dispute that it should be happening. Despite no observable evidence in the 20th century, the National Oceanic and Atmospheric Administration (NOAA) has been studying ocean chemistry for decades and documenting carbon levels in the water. At the beginning of this century, oceanographers started conducting research on cruises in the Puget Sound, where they observed OA and began to understand the severity of this issue locally. Crucial to this understanding were time-series that NOAA had generated for decades that have been used to refute claims about the “natural” influx of CO2 saturation in the Puget Sound. Two primary factors (unrelated to human activity) cause higher-than-average-levels of CO2 in the Pacific Northwest. Upwelling occurs frequently along the coast, which is where cold water (that retains gasses better than warmer water) from deeper depths in the ocean rises to the surface due to winds near the coast, dragging up stored CO2 with it. Additionally, generated by differences in heat and density, the ocean acts as a large conveyor belt in which water sinks and rises as it moves around the globe—a cycle called thermohaline circulation which takes around 1,000 years to cycle. The North Pacific is the final destination for this water before it sinks at the pole and begins the cycle again, water near this area has collected CO2 from all of the organisms it has encountered for a millennium. Upwelling and thermohaline circulation in addition to anthropogenic factors makes the Puget Sound much closer to crossing the threshold than many other places on earth. The “threshold” that is referred to frequently is 1. More specifically, an aragonite saturation state which is less than 1 is where organisms tend to be in great peril. Aragonite is often used to track ocean acidification, as it measures carbonate ion concentration. When excess carbon dioxide enters the ocean, the reaction with the water results in carbonic acid. Carbonic acid lowers carbonate ions, which is extremely detrimental to corals, clams, oysters, various plankton, and other organisms that use carbonate ions to form their shells or skeletons. This causes migration, lack of reproduction, or death. Juvenile organisms are particularly affected by lower aragonite saturation states, but migration, lack of reproduction, and death occur in all age-ranges of organisms that rely on carbonate ions. This is what occurred in Pacific Northwest oysters. In 2008, when Pacific Northwest oyster hatcheries collapsed, local farmers eliminated the usual factors that would normally cause a failure of larval development—bacteria, temperature increase, etc. Confounded by the dismal yield that season, they met with marine biologists and oceanographers in Seattle, who had recently returned from the cruises documenting carbon levels. Having just observed the severity of OA, there was no question that the issue should begin affecting the farms. The oyster decline seemed inevitable based on their findings, and the collapse was unsurprising. In a simple experiment, scientists buffered the water to change the pH levels and observed whether the oyster larvae survived. They did. Now the acidity of the water that oyster larvae are hatched in is heavily controlled, and larvae survival rates have returned to normal. What began that year was a vital partnership between NOAA and UW scientists with the local shellfish industry. A key entity in this partnership is Washington State Sea Grant. Meg Chadsey, who acts as a liaison for the organization, describes Sea Grant as a “two-way pipeline” that not only allows businesses to utilize data from federal and university research, but also allows these businesses to ask questions that will shape and direct the sort of research performed. It stays neutral in order to act as an unbiased broker for information in order to facilitate practical and applied research about on-the-ground problems that need immediate solutions. Chadsey holds another liaison role at NOAA Pacific Marine Environmental Laboratory (PMEL) in order to facilitate meaningful research between scientists and those in immediate need of science’s answers. Already, advancements are being made to answer this question. Sea Grant has partnered with UW scientist Carolyn Friedman to investigate the effects of oyster and eelgrass co-cultivation. Eelgrass Wasting Disease is currently a serious problem facing eelgrass on San Juan Island, but, fortunately, oysters happen to reduce the known pathogens that cause it. Meanwhile, eelgrass—a photosynthesizing organism—absorbs CO2 and performs better in a CO2 rich environment, as carbonite ions are unnecessary for its functions. The eelgrass, whose health is aided by the diminished pathogens, reduces the CO2 (and therefore acidity) in the surrounding waters and supports oyster growth. A greater question that others at Sea Grant are attempting to answer is, “What’s the effect on people?” Kevin Decker, the Sea Grant economist, tries to quantify this. There are many factors, however, that prevent an easy answer. For example, due to upwelling, the specific location of a hatchery along the Puget Sound will cause a monetary loss directly due to ocean acidification to vary. Larger companies like Taylor Shellfish move a significant amount of their seed development to other regions, such as Hawaii, before shipping the oysters back to Washington when they are less vulnerable. Smaller farms in South Puget Sound regulate the pH themselves instead. However, in Decker’s 2015 report to the state1, the shellfish industry adds $270 million to the state’s GDP. Ocean acidification jeopardizes $110 million annually for the industry—which is quite detrimental to the small towns that rely on the oyster industry as drivers of their local economy. Even more disadvantaged are tribal communities that harvest oysters, and to which there is not only economic but also cultural significance tied to shellfish. A study2 on the social vulnerability of shellfish decline across the United States at first glance provides a relatively positive outlook for the Pacific Northwest compared to the rest of the country. In other places where shellfish collection is prevalent, namely East Coast states like New Jersey and Massachusetts, and certain regions in the South, social vulnerability is extremely high compared to the overall moderate social impact on the Pacific Northwest. However, due to upwelling and thermohaline circulation, the timeframe in which those regions will feel the severe impacts is roughly 100 years, whereas communities in the Pacific Northwest are expected quantifiable economic hardships within a few decades. Perhaps nothing better sums up Dewey’s unique opportunity for science communication than when asked why oysters specifically are provocative. He says, “It’s people, it’s jobs, it’s food—food people can relate to. A lot of the other effects people have trouble relating to.” He notes that many other organisms that currently are being directly impacted by OA are low in the food chain and therefore many people do not react to them, using terapods (planktonic snails living mostly in arctic water) as an example of animals that humans do not care about because we do not eat. “But salmon do,” he adds. For all the research currently being done on OA and shellfish, the farmers themselves have ran experiments since the inception of their businesses, whose successes are a series of “trial-and-error”, according to Dave Pederson at Taylor Farms. 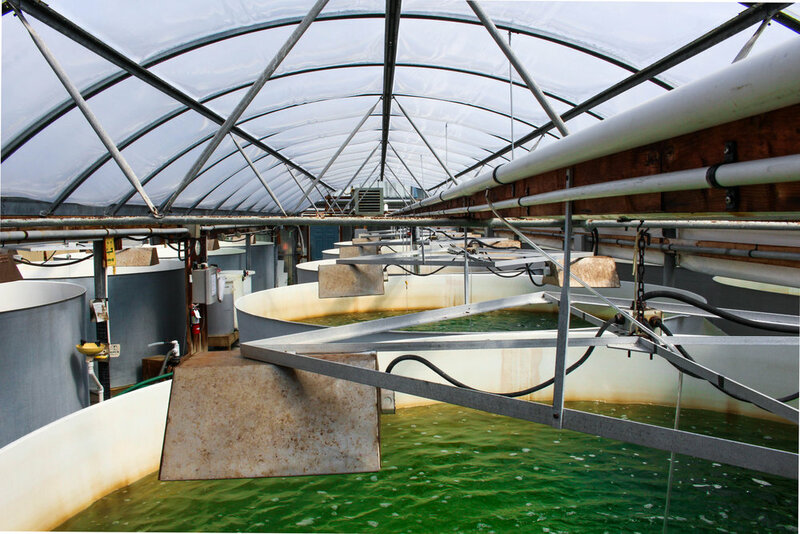 They work to determine how to optimize growing seasons, having only last year installed heaters to extend the growing season of algae. Taylor Farms grows all the feed for their shellfish; huge teal and viridian cylinders containing diatoms and flagellates (different types of plankton) are the sole limiting factor on annual yields. 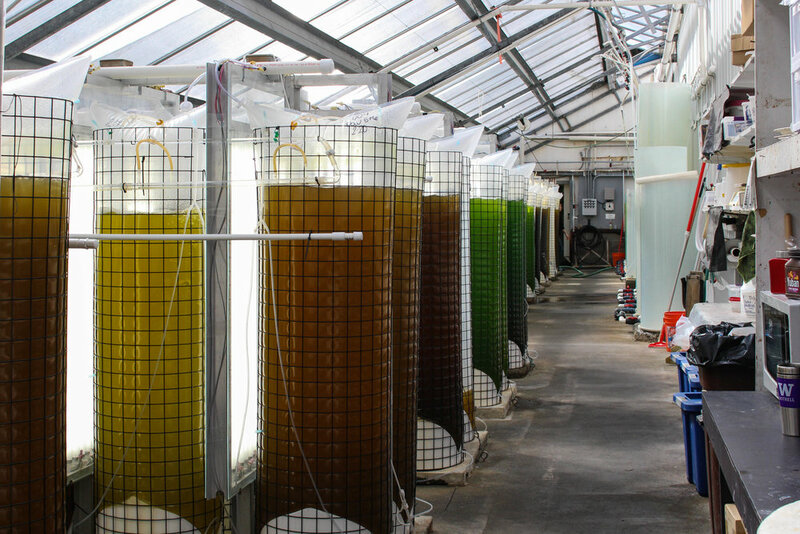 In an ongoing effort to maximize growth for the oysters, they experiment with different combinations of algae feed and alter the ratios over time. Dave, who knows better than anyone how sensitive oysters are to changing ocean chemistry, is grateful for the nearby organic farms for reducing fertilizer runoff and for the community for its ongoing effort to replant trees and wiring off streams. But even an extremely conscientious community like Quilcene has yet to find ways of preventing the blooms of bright coccolithophore phytoplankton that turn Dabob Bay water into a Caribbean-like blue every several years. Few oysters survive the rapid influx of algal growth. Dave explains that many environmental factors cause oyster death, but they are exacerbated by OA, like a weakened immune system is to us. Increased acidification will weaken the organism’s ability to cope with various stressors. He brought up a sobering fact towards the end of the tour; due to the timescale of upwelling, the added CO2 causing oyster decline is from about 60 years ago. The increased concentration of carbon currently put into the atmosphere is already stored underwater and waiting to resurface in another 60 years. To what extent oysters—and the many other marine organisms impacted by OA—will have survived that far into the future to feel the increased concentration is unknown. There is an unidentified orange bucket lying by one of the larvae tanks in the hatchery. Like large, silver ears, several shells piled upon one another glisten under the water. When asked during the tour about an unlabeled bucket full of bivalves, Dave replies, “That’s someone’s dinner.” Before or after work, employees at Taylor Shellfish harvest shellfish along Dabob Bay, as if no time had passed at all.